To the readers of the present generation much of this book will, doubtless, seem incredible. Still it is a book of facts—a section of our social history, which is, I think, worth writing, and deserving of meditation. No doubt gambling, in the sense treated of in this book, has ceased in England. 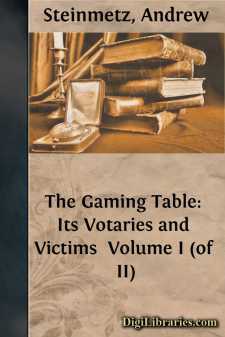 If there be here and there a Roulette or Rouge et Noir table in operation, its existence is now known only to a few 'sworn-brethren;' if gambling at cards 'prevails' in certain quarters, it is 'kept quiet.' The vice is not barefaced. It slinks and skulks away into corners and holes, like a poisoned rat. Therefore, public morality has triumphed, or, to use the card-phrase, 'trumped' over this dreadful abuse; and the law has done its duty, or has reason to expect congratulation for its success, in 'putting down' gaming houses.